Mac users are always on the lookout for cool new applications. Fortunately, there are plenty of apps — free ones at that — to entice you whatever type of person you are. As we like to do from time to time, we chose four freeware apps for this issue that we think will make your Mac life easier and even happier. You have friends on Facebook, each showing a nice profile picture, but your address book’s image fields are empty. Now there’s something you can do about it that doesn’t involve time and tedium. If you want your friends’ profile pictures, birthdays and current locations matched to your Mac OS X address book, the AddressBookSync application is a truly useeful tool. You can select the friends you want to be synched to your address book and even crop/scale the profile photos. And if you have an iPhone (or another phone that supports synchronization with your address book) your friends’ profile pictures will show in your screen when they call you. If you need detailed information on your Mac (whatever model it is), such as processor speed, memory, optical drives, graphic cards, supported Mac OS versions, expansion options and want to add details about your own models such as serial numbers, purchase dates and warranty coverage dates, download Mactracker. This app is a must-have if you are going to be upgrading your Mac’s memory, adding a hard drive, or getting ready to buy or sell a Mac. Do you have several Macs, but you are overwhelmed with multiple keyboards and mice? If so, check out teleport. This utility allows you to control multiple Macs from one mouse and keyboard. You can even synchronize your clipboard and drag and drop files between Macs. Just install Teleport on each machine you need to control, show it how your monitors are laid out, and start using just one keyboard and one mouse across all the screens. Truly amazing stuff! Have you come across any great freeware apps for the Mac that you think we should know about and mention here? Drop us a line and let us know — just reply to this message. As summer heats up (well, here in the Northern Hemisphere, at least) so have the offerings of our many designer partners who have been building some stunning add-ons for Sandvox. We just have to share these with you! 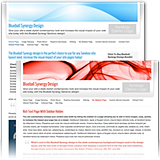 Blueball Synergy is a stylish and unique minimal design; it has a professional yet relaxed look. Truly, it’s one of our favorite designs for Sandvox so far. The design’s layout and minimal colors are perfect for business sites. It features a custom font, Graublau Web Bold, for its headers. Its horizontal navigation menu allows for page name wrapping to multiple lines to allow more site pages. It comes in blue, orange, green, brown, burgundy, pink, purple, red, and teal. The brown variation is our favorite, but whatever color you choose, your site will be attractive and inviting. This month there are three (!) new designs from 11Mystics. Canyon, built out of bold “earthy” colors, comes with special styles for supporting banner ads. Minimocity exudes minimalism: If you like a simple look and beautiful typography, you might need this design. It features unique styles and special blog index layouts. Daroo is a semi-artsy, textured design. All of these designs are highly customizable via Code Injection (Sandvox Pro), and feature the 11Mystics original fat footer, extensive subtle CSS3 transitions and effects, pure CSS3 gradient buttons, and more. Really something special! Blueball Designs Vol 3: Get a total of 38 individual Sandvox designs for less than $1.00 per design and save up to $21.00 off the list price. Includes “First Class,” “Minimal Colors,” “White,” “Qubit,” and “Shadow” designs. They all come with normal and wide page width variations, built-in image resizing, detailed read-me files, and layered PhotoShop files to help you create your own custom banner images. Learn more about it here. BehindTheRabbit Summer Pack: This designer is having a special sale through August 31st on a great pack of designs. The “Summer Pack” features “Lake,” “Grafite,” “Blue Raymond,” “Carbone,” “Orange Rabbit,” and “Roseto.” Get all six designs together for $29. Be sure to check out the guest post on The Karelia Blog by Suzanne of 11Mystics: It’s Good to Be a Newb. It’s full of tips and tricks that may interest Sandvox novices and veterans alike! Would you like “pandacakes” for breakfast? The American Sandbox was built by Alvin Zamudio using Sandvox Pro. (Yes, it’s difficult for us to type the word “sandbox” with a B instead of a V!) Mr. Zamudio chose the blue variant of Blueball’s “White” design because it looked most like the way he wants the printed version of his book — The American Sandbox Dictionary of Children’s Mispronounced English to look like. The site should bring big laughs to parents of younger kids. Vaughan Woods from Singapore chose Sandvox Pro’s “Distinction” design to build his website. 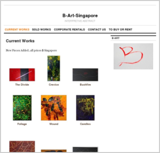 B-Art-Singapore showcases images of abstract art. Site visitors can enjoy and appreciate the rich colors and shapes of the art, and rent or buy art pieces. Art pieces purchased from the site are now being displayed in corporate offices and homes in Australia, Singapore, USA, China, Dubai and elsewhere. Ty Sayman, a U.S. expatriate living in Germany, used Sandvox to build the website for his iPhone software company, Sayware. This site was built using some advanced techniques: it uses both JQuery, for playing a slideshow of iPhone screenshots, and Lightbox to display pop-up images. Raw HTML pagelets were used for the iPhone app icons down the sidebar on the pages for each software title. Be sure to check out Sayware’s software if you have an iPhone!